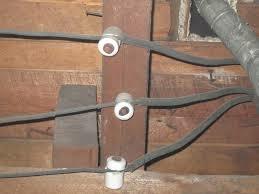 When looking to purchase an older home keep an eye out for knob and tube electrical wiring. You may be able to spot this in an unfinished basement or attic. Knob and tube is a type of branch electrical wiring that was installed in older homes (usually early 1900's), considered substandard by present standards. The insulation becomes brittle with time and may be a safety hazard. If the wiring is covered by insulation (like in an attic) it could overheat and cause a fire. Circuits hooked into this type of wiring are usually not grounded. While knob and tube wiring is normally functional I recommend upgrading and rewiring. Also, many insurance companies may have restrictions concerning knob and tube wiring. It is not permitted in new construction. How Knob-and-Tube Wiring Works: K&T wiring consists of insulated copper conductors passing through lumber framing drill-holes via protective porcelain insulating tubes. They are supported along their length by nailed-down porcelain knobs. Where wires enter a wiring device, such as a lamp or switch, or were pulled into a wall, they are protected by flexible cloth or rubber insulation called "loom." Compared with modern wiring insulation, K&T wiring is less resistant to damage. K&T wiring insulated with cambric and asbestos is not rated for moisture exposure. Older systems contained insulation with additives that may oxidize copper wire. Bending the wires may cause insulation to crack and peel away. K&T wiring is often spliced with modern wiring incorrectly by amateurs. This is perhaps due to the ease by which K&T wiring is accessed. Building Insulation: K&T wiring is designed to dissipate heat into free air, and insulation will disturb this process. Insulation around K&T wires will cause heat to build up, and this creates a fire hazard. The 2008 National Electrical Code (NEC) requires that this wiring system not be covered by insulation. Specifically, it states that this wiring system should not be in hollow spaces of walls, ceilings and attics where such spaces are insulated by loose, rolled or foamed-in-place insulating material that envelops the conductors. Local jurisdictions may or may not adopt the NEC’s requirement. Do not run an excessive amount of appliances in the home.